Congrats on your top 10 finish. Excellent shot! Great water play. Congratulations on your top 10 finish. Very calculated, right down to the shadows, exceptional work. This motion is so crisp and the water is frigidly colorless rendering the green subject so intense. I'm looking at a winner here - this is at the top. Well done. Very cool image! Splashes have been done so many times, but the color selection, lighting and clarity of this image really make it stand out above the others. Good luck! Ok. Here's a splash that's going places! ;^) Sorry, I've seen so many in this challenge I'm getting tired of seeing water. As cliche as this shot is, it's going to make the front page. It's clean, crisp, well lit and focused. Congratulations in advance on your ribbon. ;^) Take care. Pleasing with it's simplicity. Really like whatever it is that's formed the background. I wish I could have voted in this challenge (registered user here), the photo is awesome and a perfect 10...good luck to ya! excellently dramatic picture! 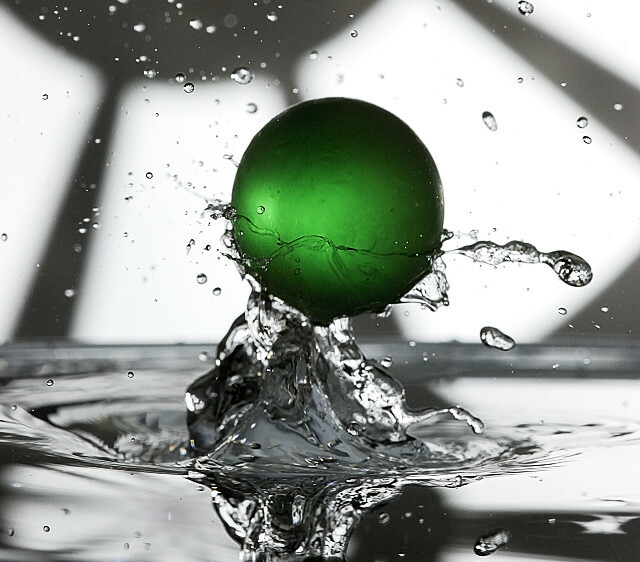 i love the geomtric nature of the lighting in the background, the lovely luminosity of the green spherical thingy, and the capture of the motion of the water is all brilliant. the only slight thing not giving it a ten for me is the odd lack of symmetry, which makes the overall impact a smidgeon unbalanced. otherwise, great stuff - 9. Proudly hosted by Sargasso Networks. Current Server Time: 04/26/2019 09:40:55 AM EDT.